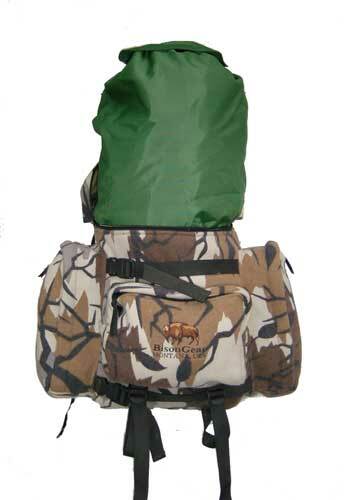 A couple folks asked me for more information about my Bison Gear Lost River Pack. So here it is, multiple pictures and some explanations on how I use the pack and the way I have it set up. Here's the pack as it comes, a lumbar pack and without a frame, more of a large fanny pack I guess, though there is plenty of room in this pack for most of my needs. 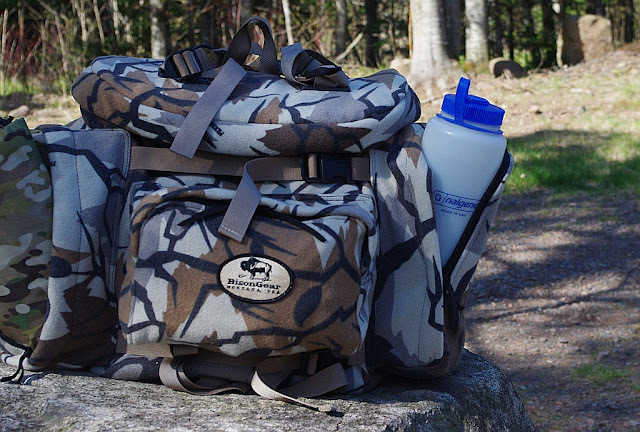 The side pockets hold a 10x10 BCUSA tarp and a 48oz Silo Nalgene like they were made for them. A very nice fit. 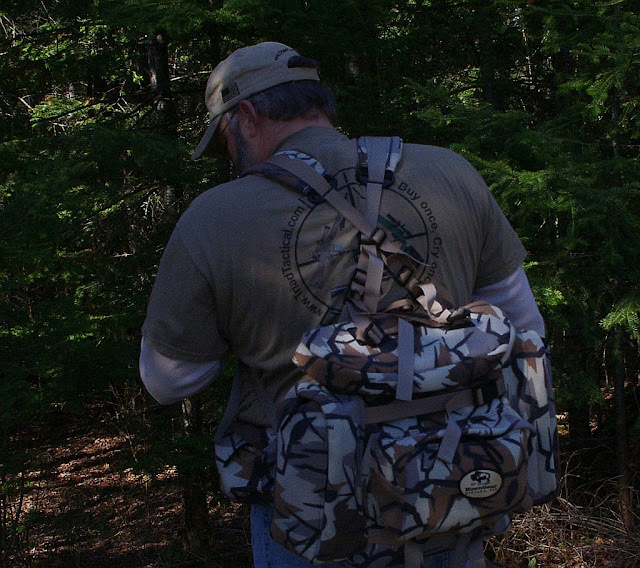 The center rear outside pocket holds my cordage and water filtration kit perfectly. 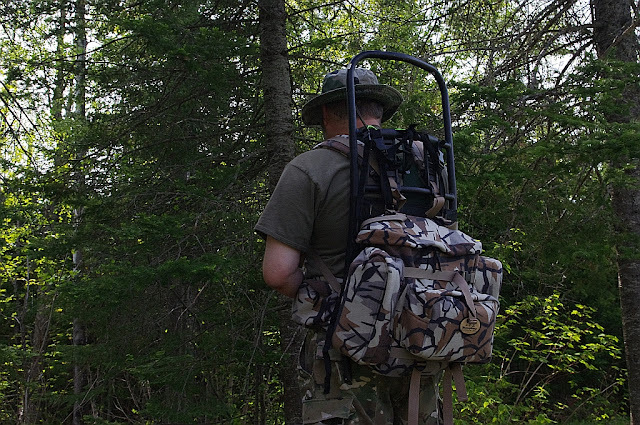 This allows me to keep shelter, and hydro outside of the main pack, leaving the main compartment for cook kit and miscellaneous gear, game calls, rain gear and so on. Main compartment is large enough to haul the rest of my gear for spring, summer, early fall, enough for a three day excursion. For longer trips you can add the pack to a frame, more on that later. There are external lashing straps both on the bottom and the top of the pack. In the two images below you'll see I have a multicam MEST with a issue Wobbie inside it rolled up and attached. This makes for a very nice and very light weight bed roll. 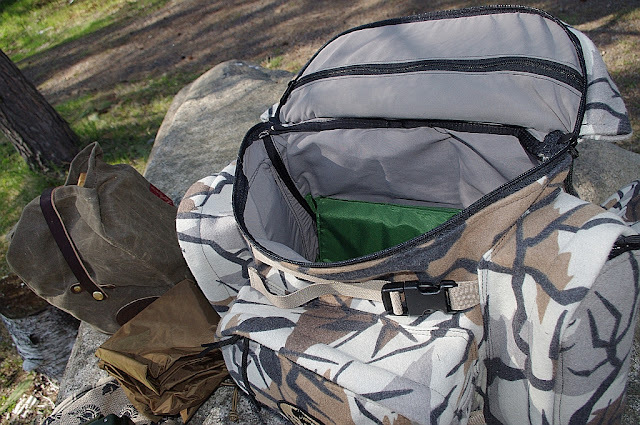 If so desired there is also plenty enough room inside the bag for my Grand Trunk hammock. There are also pockets on the waist belt, one on the left and one on the right. 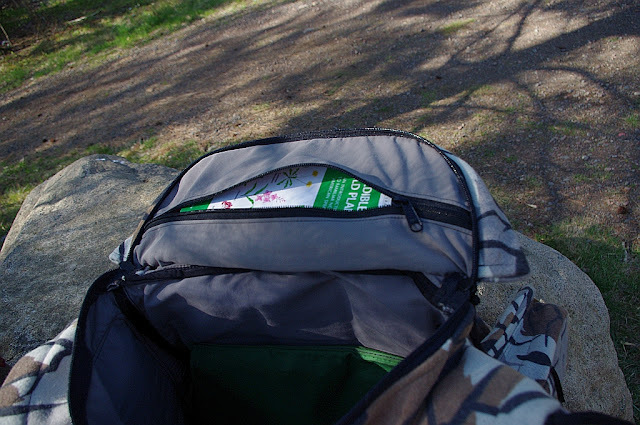 Perfect size for compass, bug repellent, GPS, or other items you might want quick access to. The below images are of the pack attached to a frame to show you how much more space this allows for. Obviously the frame above where the pack is would be where you'd lash heavy, bulky items, sleeping bags, an Elk quarter etc. 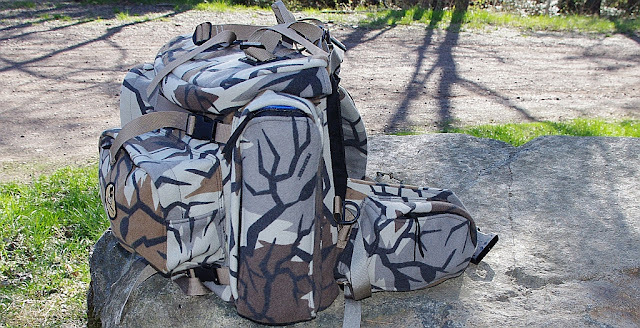 I'm really digging the pack, not having the whole back covered sure is a lot cooler in warm weather. 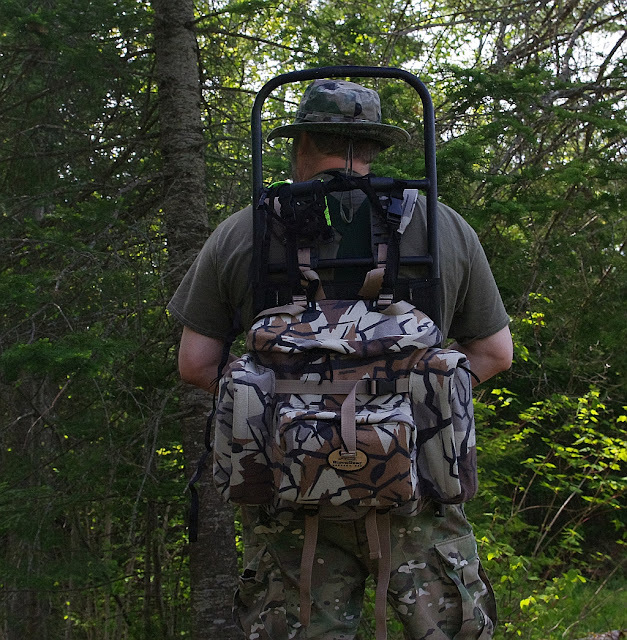 This set up also allows you to pack into your spike came, take the pack off the frame and hunt out of it as needed during the day. 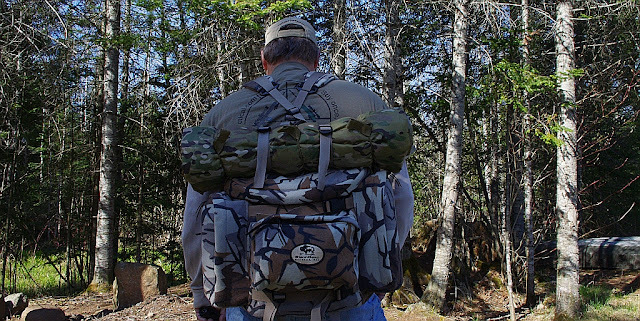 Essentially it's two pack in one, a freighter to get you there, then convert it to a lumbar pack capable of getting you through an unexpected overnighter away from your main camp. The shoulder straps and waist belt are part of the pack, you use them with the frame, don't have to have a separate set. I don't know who made the frame in the images, I'm trying to figure that out, it's one I had laying around and the fit is perfect. The Bison Gear website has some information about which frame works with the Lost River pack and I can tell you that Angelo, the owner is great to work with. 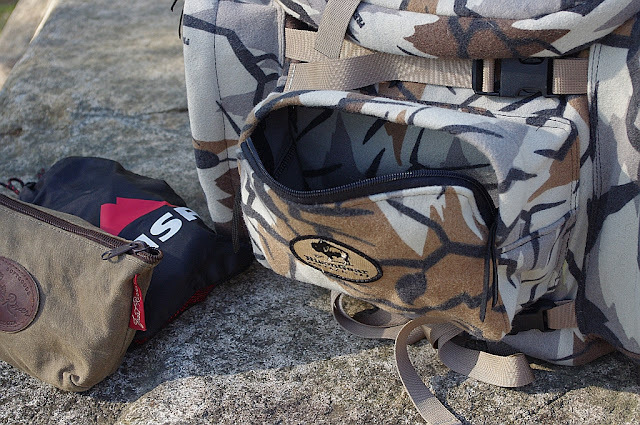 There is also an internal detachable game bag for hauling out your meat. It's 1265ci by itself, detaches internally and fold flat in the bottom of the main compartment. Here's a picture of it extended for use. So far I am thrilled with this pack, you can be sure there will be plenty of updates regarding this rig in the future. This will be perfect for the trip we have lined up later this year. Where did you purchase it from, is it available online? 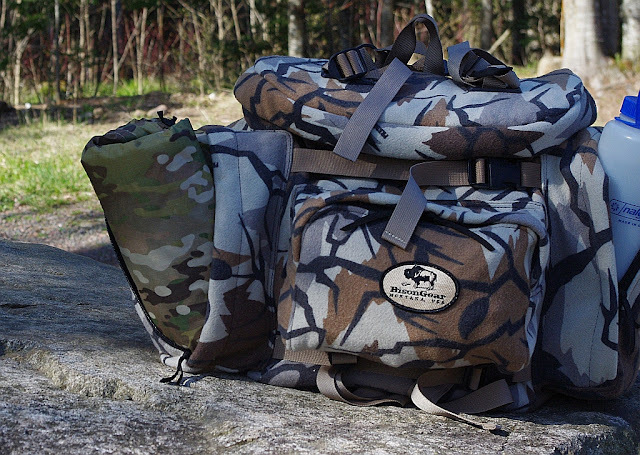 A google search for bison gear packs will net you a couple other online retailers.